I took this Gallup poll result from the New York Times “Taking Note” column, just because I wanted to take note. 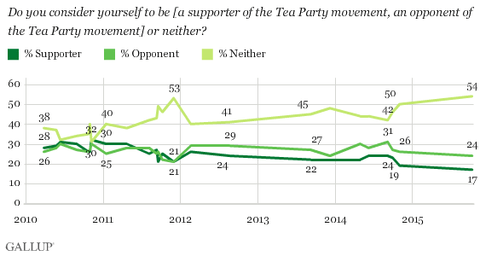 Support for the Tea Party in surveys peaked at the end of 2010 at less than 30 percent, and then has declined fairly steadily, now down to about 17 percent. What’s this mean anyway? The Tea Party was a vigorous and volatile social movement starting with that name just after Barack Obama took office. It was visible during the 2010 election, and claimed responsibility for the very large Republican gains in the House of Representatives. But assessing membership in a movement is always tricky, no less so for a movement that mostly abandoned demonstrations after winning a firm institutionalization in both Congress and in the world of Washington-oriented advocacy organizations. Most supporters were never going to demonstrations or even meetings, much less donning the tricorner hats that make for such good photos. Still, it’s easy to find numerous organizations with Tea Party in their names, pushing for conservative causes, and an even larger group of groups that have been pushing conservative positions on a range of issues. In the House, a Tea Party caucus in the Republican Party, initially led by Michele Bachmann, came and went, and has largely been replaced by the Freedom Caucus, which claimed the career of Speaker John Boehner and promises to bedevil his successor. For many reasons, this institutional version of the Tea Party commands less popularity than the one focused on stopping health care reform in 2009 or President Obama more generally in 2010. But what does “Tea Party” mean anymore anyway? The acronym, “Taxed Enough Already” remains, and the Freedom Caucus is firmly opposed to taxes. It’s also still stalwart in opposing the Affordable Care Act, but that ship has sailed. Its members are vigorous in opposing immigration reform, ostensibly because Obama is president, but I can’t imagine a program that will pass muster with this group. The groups behind the Tea Party (FreedomWorks; Americans for Prosperity) in the early days were absolutely not in this rejectionist camp on immigration. More than anything, Tea Party has become shorthand for an attitude of strong commitment and vigorous opposition. And that seems to sound better as ideal and as strategy when government is actually getting things done. Establishment Republican figures continue to struggle with finding a way to manage their own radical flank. This entry was posted in Uncategorized and tagged Affordable Care Act, Americans for Prosperity, Barack Obama, demonstrations, Freedom Caucus, FreedomWorks, immigration, John Boehner, michele bachmann, polls, Republican Party, taxes, tea party. Bookmark the permalink.